Tregothnan hope the garden will combine two great British pastimes. A Cornish company which makes its own tea wants to set up an international tea centre in the county. Tregothnan Tea has arranged to sell its Classic Tea through Fortnum & Masons in London while other blends are available on the internet. The firm first started making tea on the banks of three rivers near Truro in Cornwall in 1999. Their success has been achieved with help from Objective One's Cornish Horticulture Enterprises. The company says it has succeeded in creating the ultimate quality leaf in conditions superior even to those in Darjeeling, home of the world's most famous tea. Tregothnan has been cared for by Lord Falmouth's family since 1335. Head gardener Jonathan Jones said: "We have a special micro-climate there which we've proven really works. You can grow tea elsewhere but not like we have." 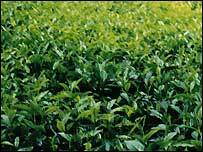 The tea comes from a special form of Camellia sinensis. Tregothnan was also first to grow Camellia ornamentally outdoors 200 years ago. Now Tregothnan plans a tea centre telling the real secrets of tea with the support of the international tea industry. Jonathan Jones said: "We are trying to bring tea and gardening - two very popular British pastimes - together."